Tineke love to have their work featured in national press, giving Brides and Grooms all over the UK, inspiration and ideas for their wedding day. Here are just a few of the more recent ones that we have been involved with, looking forward to receiving more images soon for wedding flowers supplied throughout Derbyshire, Cheshire, London and beyond! This evening, we bring to you a fabulous blog post by Mirlah of our gorgeous friends at Darby and Joan Vintage, hope you enjoy it! Hello there lovelies! Summer is trying to hold on despite the storms, but if it's still a little grey and miserable where you are then we've got a lovely post to brighten up your day! We're turning our heads to flowers today! Showing you ways to inject floral fun into your wedding day. We've also got a great little interview with some industry experts. 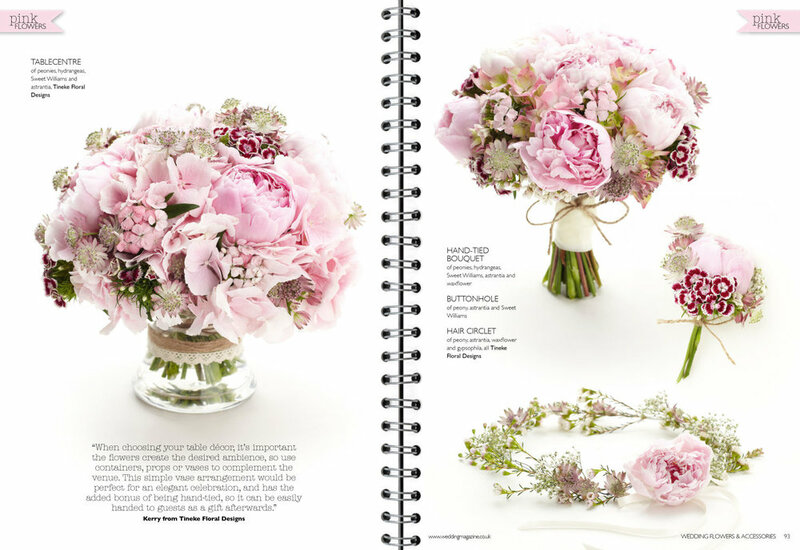 We caught up with Tineke Floral Designs who kindly shared with us their tips and what trends are proving popular in 2013. Ahh I do love a floral crown, there's something so elegant and effortless about them. With festival season well under way, floral crowns are a firm favourite with brides this year. From the elaborate to the delicate. The vibrant to the pastel, floral crowns are a show-stopping way to add a touch of whimsy to your day. When planning your wedding you'll no doubt face the saying 'don't sweat the small stuff.' Of course the details aren't the be all and end all of your wedding day, but they are the little nuggets of gorgeousness that bring your styling together, and with todays couples turning their hand to a bit of DIY, it's those details that give your day a personal touch too! You can add some floral fun to your details and styling in so many ways, starting with the invitations. Create a gorgeous memorable scent by adding a sprinkle of lavender or opt for a floral illustration to set the tone. Create the perfect spot to say 'I do' or say 'Cheese' with floral backdrops for the ceremony or a fabulous photobooth. Jazz up an elegant naked sponge cake with handpicked flowers. Why not add a touch of 'Flower Power' to your favours? Seeds or succulents make wonderful gifts and can double up as place settings too! Perfect! The High Street this Spring/Summer is adorned with florals and patterns and it's no surprise that wedding fashion is fully immersing itself in this trend too. Whether it's summer brights and big, bold patterns or 'Kitson' inspired pastel prints, there's something for everyone. If you don't want to don the florals on your big day, add subtle touches to your shoes or accessories and leave the rest to your bridesmaids, 50s style dresses are perfect for a bold print. Last but not least, the groom. Who could resist adding a splash of floral pattern to that tie or pocket-handkerchief. Gorgeous. Hello! Tell us a little bit about yourself. My name is Kerry Wilkinson and I own and run Tineke Floral Designs which was established by myself back in 2005. The company has seen amazing growth from very small beginnings in my parents garden shed with help from my ever understanding and supporting partner Andy, along with brother John and his partner Shaun. We now have on board Avie and the help from my Dad and other brother Martin. What do you enjoy most about being a Floral Designer? I enjoy bringing peoples visions and dreams to life on their wedding day and seeing all of the beautiful ideas come to life. What trends have you been seeing recently in 2013? We have certainly seen more colours and vibrancy within floral designs and people are opting for more glamorous designs using silverware and glass. What advice would you give to couples beginning to choose their wedding flowers? I would start to keep your eyes out for ideas and start pinning or cutting out ideas to bring along to your floral appointment, Any colour samples or fabric also helps. Also, keep an open mind and look for flowers in season as these are always at their best quality and price. Above all, enjoy it! Flowers are amazing! Thanks so much Kerry, we think flowers are amazing too! We're just in love with your studio and consultation room, and of course, your beautiful designs. You can find out more about Tineke Floral Designs on their website, Facebook & Twitter, not only are they lovely they're award winning too don't you know!